3herosoft iPhone Mate is a super suite of iPhone software including 3herosoft iPhone video Converter, 3herosoft DVD to iPhone Converter, and 3herosoft iPhone to Computer Transfer. It can easily backup, copy, transfer and manage music, video, movie, podcast and TV show between iPhone and pc even without iTunes and convert DVDs and all popular movie and music files to iPhone video formats MPEG4, MP4 and audio formats MP3, AAC, M4A and so on. ...... All formats compatible with iPhone are supported. 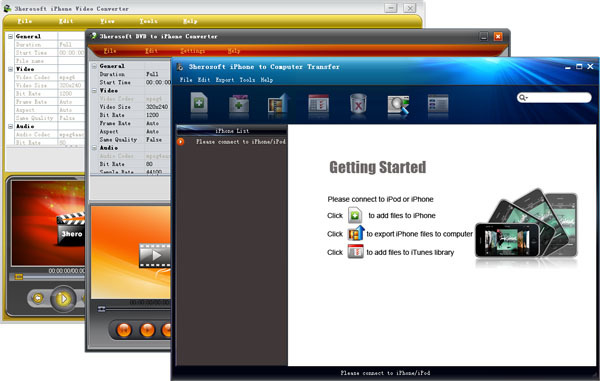 3herosoft DVD to iPhone Converter is easy-to-use and powerful DVD to iPhone converter software for iPod Classic, iPod Nano, iPod Touch, iPhone, iPhone (3G). It can easily convert almost all kinds of DVD movies to iPod video MP4, MP4 AVC and iPod audio MP3 and M4A, AAC with the latest MPEG-4 video encoding technology. 3herosoft iPhone Video Converter can convert almost all popular video files including AVI, DivX, XviD, WMV, MPEG, MPG, DAT, RM, MOV, ASF, VOB, FLV and so on. Qweas is providing links to 3herosoft iPhone Mate 3.8.5.0214 as a courtesy, and makes no representations regarding 3herosoft iPhone Mate or any other applications or any information related thereto. Any questions, complaints or claims regarding this application 3herosoft iPhone Mate 3.8.5.0214 must be directed to the appropriate software vendor. You may click the publisher link of 3herosoft iPhone Mate on the top of this page to get more details about the vendor.